This is what happens when you try to mix Sonic the Hedgehog with Mario. You thought the rings were just a silly convention of Sonic, nooooo. The truth is, the speedster hedgehog is the only thing that can handle the rings without calling forth the horror that lies within it. 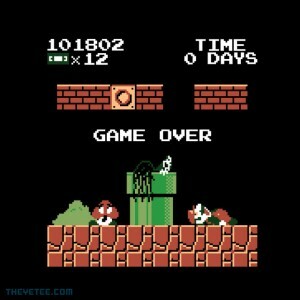 Never, ever allow Mario to watch the tape with the ring on it. Unless you’re Bowser. In that case, you’ll probably want him dead. But, I mean, c’mon, do you really wanna watch something that gruesome? Wrap this cloth around your torso to remind yourself to be kind, rewind, and blow the cartridge.